The YouTube Go app was announced last year and it hit the Google Play Store in 2018. YouTube Go is a toned down version of YouTube. It is lightweight, intuitive, and powerful. YTG has been designed for entry-level Android devices. Users who own an expensive smartphone can also use this application. When users run the app for the first time, YouTube Go asks them to select an interface language. It also prompts users to enter their phone number. The users must verify their number to use the app. The UI of YTG application is sleek and beautiful. The main interface of YTG features a search box and two tabs – Home and Download. The Home tab displays a list of video thumbnails. You can refresh the list by swiping down the screen. When you select a thumbnail, YT Go displays a dialog box that has the option to preview the video and select the video streaming quality. The box also features two buttons – Download and Play. It displays the amount of free storage memory on the MicroSD card/ROM of your device. Video length, upload date, title. To play another video, tap the thumbnail. The download option doesn’t work for all videos. If the video is copyrighted, you can’t save it for offline viewing. To see the downloaded videos, tap the “Downloads” tab. YTG lets users pause the downloading tasks. The downloaded videos are playable only on the YouTube app. They’ll disappear if you don’t connect your phone to the internet for 2 to 3 days. Sharing: YTG enables users to share downloaded videos with friends over a WiFi or Bluetooth connection. Users can also receive videos from their friends with this application. Search: As in the Youtube application, YT Go doesn’t allow users to filter search results by video size, resolution, etc. Settings: The app features a settings interface from which you can delete the search history and change the location where the app saves videos. The settings panel also includes an option to turn off the Daily and Recommended videos feature. Comment: You can’t read or leave comments on videos in this application. Bell Icon: Users can’t subscribe to channels in the YouTube Go app. To make sure that users don’t get frustrated or bored, the app learns the user’s watching habit and recommends videos on its home tab. Minimize videos: You can’t minimize videos and explore YouTube’s large collection of videos in this app. The app doesn’t remember the frame number. Hence, if you close the video and play it again, YT GO will play the video from the beginning. Even if you pause the video and tap on the back button, you won’t be able to resume the video from the point it was paused. No upload option: Uploading videos is not possible in the YTG application. Trending: YouTube GO doesn’t have a trending videos section. The trending section on YouTube app/website is often populated with movie trailers, songs, etc. I’m not a movie buff. Hence, I’m glad that YTG doesn’t have this section. Conclusion: YTG is a great application for the users who don’t use unlimited data plans. Users who don’t like the Channel Subscription feature or commenting on YouTube videos will also enjoy using YTG. YouTube Go is a powerful video streaming application. 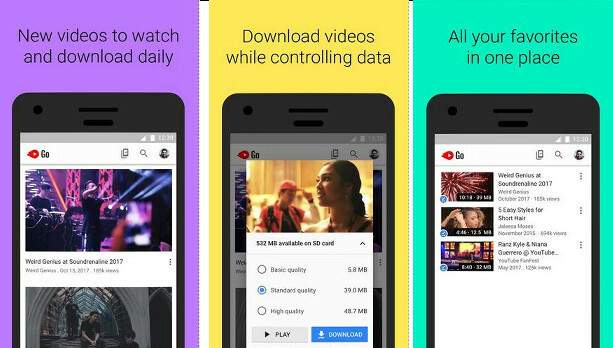 It allows users to download videos for offline viewing. It also helps users in saving WiFi or mobile data.